The four motor EV concept is nothing like the production model, though. Acura's eagerly anticipated next-gen NSX is finally going into production for 2017, but the car will hit the road before then -- sort of. 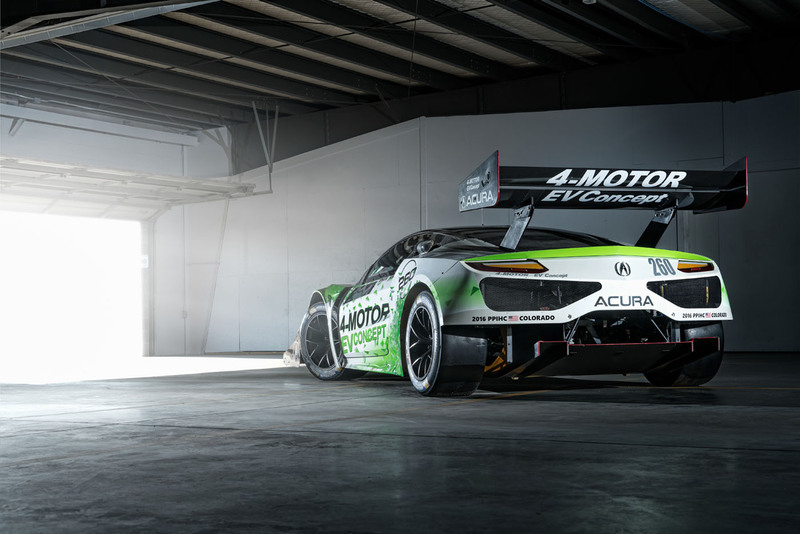 The company will race a highly modified version at the Pikes Peak hill climb event on June 26th. However, unlike the (mostly) gas-powered consumer model, The "EV Concept" race vehicle will be powered by four electric motors, one on each wheel. That means it looks roughly the same as a production NSX (other than the scoop and wing), but the custom EV drive train is completely different and built for racing. The company hasn't said how much power the motors make, but they will give the car something called "four-wheel torque vectoring." That means engineers can dial a precise amount of power to each wheel, making it perform better in corners and when accelerating. The car also uses regenerative braking to extend the battery life. Electric vehicles are ideal for Pikes Peak, since they aren't affected by the 14,000 foot elevation that chokes gas-powered engines. Last year, Rhys Millen raced a modified eo PP03 up the track in 9:07.222, a time that would have won the gas-powered unlimited class in every year but 2013 and 2014. (Sebastien Loeb holds the unlimited record at 8:13.878, a time set in 2013). The Acura NSX production car, set to arrive next year for around $150,000, is an odd vehicle. It has a turbocharged 500HP V6, but uses three small electric motors to boost acceleration and cut turbo lag. That gives it stunning acceleration, but purists are worried. The original NSX weighed just 2,712 pounds and was loved for its lack of excess, but the new model reportedly tips the scale at 3,800 pounds, thanks to the hybrid powertrain.